Have you ever felt tested by God? I know it’s hard to believe but when God tests us it is good for our faith—it actually builds our faith. James 1:2-3 says, “My brethren, count it all joy when you fall into various trials, knowing that the testing of your faith produces patience” (NKJV). To understand how God uses trials, let’s consider the story of Abraham in the Book of Genesis. Genesis is the book of beginnings; it provides a dramatic account of the origins of mankind and his universe, the intrusion of sin into the world, the catastrophic effects of its curse on mankind, and the beginnings of God’s plan to bless the nations through His seed. The story in Genesis arose in a culture plagued by polytheism. The Hebrew God of Creation is different. The Biblical account presents one God, who alone is God, who created the world. The cultures of the day proposed that the world arose because of conflicts between the gods. However, Genesis demonstrates that conflict arose because of humanity’s rebellion against the one true God. With man’s propensity to rebel against God, Abraham provides a refreshing alternative. Genesis 22 contains the story of God testing the faith of Abraham. Abraham received a promise from God that he would become the head of a great nation and that God would bless him and make his name great. Further, God would bless those who blessed him and He would dishonor those who cursed him. Eventually, all the earth will be blessed through Abraham (Gen 12:2-3; Gen 15:5). Abraham, however, remained childless (Gen 15:2-3). Subsequently, Abraham fathered two boys; the first, Ishmael, was Abraham’s attempt to fulfill God’s promise through his human effort (Gen 16:1-6) and the second, Isaac, was the fulfillment of God’s promise (Gen 17:15-16; 18:9-15) to both Abram and Sarai (a.k.a. Abraham and Sarah) (Gen 21:1-7). However, Sarah saw Ishmael mocking Isaac (“But Sarah saw the son of Hagar the Egyptian, whom she had borne to Abraham, laughing” Gen 21:9). Though translated “laughing,” the stronger text connotes positively, play and sport, or negatively, mockery and derision. Thus, the stage is set for two tests of Abraham’s faith. First, Sarah pleads with Abraham to “cast out this slave woman (Hagar) with her son (Ishmael)” (Gen 21:10) and God concurs (Gen 21:12). Though God promised that Ishmael would also be the precursor of a great nation (Gen 21:13), Abraham was still displeased with the course of events because this involved his son (Gen 21:11). Even so, Abraham obeyed God and prepared Hagar and Ishmael as best he could and then sent them into the desert (Gen 21:14). Perhaps at this point in his life, Abraham believed that his trials and troubles were in the past. The conflict over Ishmael had been settled, though not without some measure of tension. Isaac, Abraham’s pride and joy, was growing up, and the patriarch may well have thought that he could live the remainder of his days in confidence that God’s promise to him was secure. But the greatest test of Abraham’s faith was yet to come. As hard as this trial would prove to be, it is minuscule compared to his upcoming test. Abraham’s trial is recorded in Gen 22:1-19. Please take some time to read this passage. Abraham’s test consisted of three parts: Abraham is put to the test, Abraham complies, and Abraham is approved by God. Let’s look at the critical thoughts of each component. “After these things” – This information is presented to the reader and not to Abraham. In addition, the narrator points back to the episode with Ishmael and the sending of him into the dessert. “God tested Abraham” – This is the ultimate test of faith for Abraham. The structure of this verse shows that Abraham “suffers the effect” of the test. That means that God is purposefully putting Abraham into this tension-filled position. God is proving the quality of Abraham through the extreme hardship. When God tested his people, he was determining the quality of their faithfulness (cf. Exod. 15:22–27). “Here am I” – Abraham was immediately responsive to the call of God. “Take your son” – God commanded Abraham to take his son, but not simply his son; he was to take his only son (he had already sent Ishmael away). This is the son he loved. Isaac was the son of promise through whom God promised to build a great nation. The command to sacrifice his unique son as a burnt offering seems very unreasonable (even though child sacrifice was known in Canaan). Regardless, Abraham left immediately (i.e. the next morning) for the mountain God would show him. 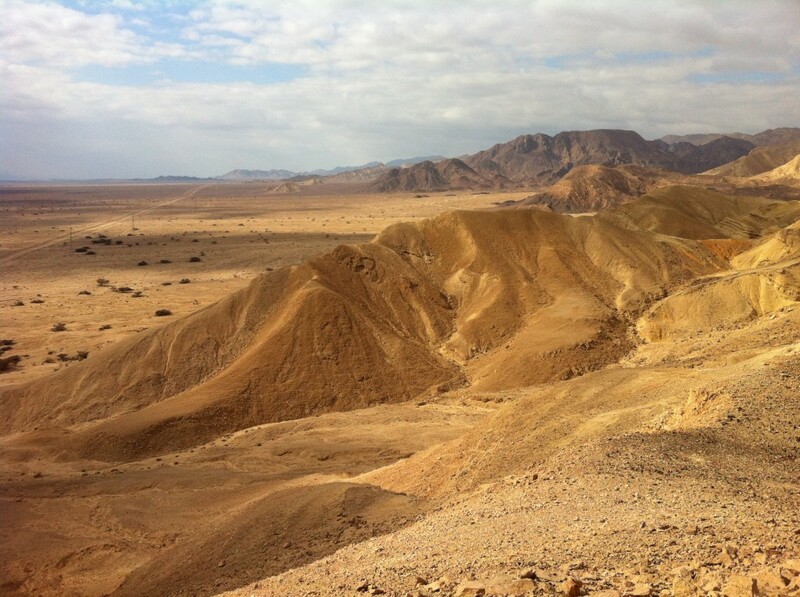 “To the land of Moriah” – Abraham was told to head toward the land of Moriah (Gen 22:2). Uncertainty surrounds the location of Moriah. Some believe that Abraham was to take Isaac to the Hebron district, perhaps Râmet el-Khalîl. If correct, the site would be up to 3000 above sea level and would be about 2 miles north of Hebron. This would mean the trip from Beersheba was only about 27 miles—hardly a three-day trip. Samarian tradition places the sacrifice of Isaac on Mount Gerizim, substituting “Moreh” for “Mount Moriah” in Jerusalem. This would make the trip about 75 miles or about 25 miles per day. Others consider that Abraham took Isaac to the hill near Jerusalem where Solomon would eventually build the first Jewish Temple (2 Chron 3:1). Abraham may have journeyed to that mountain or, if not there, to one of the mountains near Jerusalem. If this were the site then great significance would surround this event and point to David and even Christ himself. This trip would be a respectable 50 miles, which considering the rugged terrain, would be more reasonable. “Offer him” – Abraham was to take Isaac to the land of Moriah to “offer him there as a burnt offering” (Gen 22:2). This God-given command is one of the most theologically difficult passages of the Old Testament. Abraham is asked to behave in an illogical, absurd, and, to say the least, nonconventional manner. However, as so often is the case with God, Abraham’s radical behavior proves the nature of his faith. “I shall tell you” – as in Abraham’s initial call in Genesis 12:1-3, here Abraham is again told to walk to an unknown destination that God would later reveal. “Abraham arose early in the morning” – Abraham did not lag in his response to God; rather, the next morning he arose and he gathered the necessary resources, traveling assistants, and his son, Isaac and left for the land of Moriah. He did not hesitate in leaving nor did he attempt to bargain with God. “Cut the wood” – Abraham fully understood the journey before him. God wanted him to sacrifice his son. Abraham didn’t know where he was going, so he had to prepare. He cut the wood for the sacrificial fire. The tension this would bring to Abraham must have been unbearable. This certainly brings to mind that Jesus also carried His cross (wood) on His back. “On the third day” – The 3-days is critical—it seems to be a foreshadowing of the three-day journey of Israel into the wilderness to sacrifice to God in Exodus Exod 3; 5; 8 and the typical period of preparation for the most important events (Gen 31:22; 34:25; 40:20; 42:18, Exod 3:18, passim). One must also consider that Christ rose from the dead after 3-days. “Stay here” – Abraham must take this final leg of the journey of faith and obedience by himself. “The boy” – Abraham address his son as an adolescent even though he may have been as old as 25. He must have been a strong, older lad since he was well capable to carry the wood, which was necessary since the donkey was left behind. “Come again to you” – One must wonder if Abraham knew that in some way God would provide so that Isaac and Abraham could both return to their traveling companions. Abraham appeared to believe that God was able to and would “resurrect” Isaac (Heb 11:17-19) and Abraham’s faith was the same quality and caliber as Christians who believe in Christ’s resurrection from the dead. “The fire and the knife” – Abraham brought with him the tools he would need to use to accomplish this task. “Where is the lamb” – Isaac, in a show of respect, asked his father about the lamb for the sacrifice. “God will provide” – Abraham was probably thinking that God had already provided the lamb and that was Isaac. This conversation must have been excruciating for Abraham. “Bound Isaac his son and laid him on the altar” – This passage shows the obedience and submission of Isaac. He was strong enough to object to this plan; he could have resisted. But he did not. He allowed Abraham to bind him and to place him on the altar. At that time, he now would recognize that he is the lamb. The term used for “bound” is used in no other passage when associated with ritual sacrifice. “Took the knife to slaughter” – Abraham, with full intent to obey God, was prepared to plunge his knife into Isaac, his son. This is the climax of the tension developed by the narrator. “The angel of the Lord” – God has been watching over these events. Abraham had passed the test; he was fully prepared to obey God. The angel of God (perhaps Gabriel) was at hand to stop Abraham’s action and to spare his son. “Know I know you fear God” – Finally, the narrator explains the purpose of the test, i.e. to see if Abraham did indeed fear God. In the affirmative, the angel testifies, “Now I know” and forever, Abraham will be known for his faithful obedience (Gen 26:5). The one who truly feared the Lord understands that compliance with the Word of God, no matter what the cost, was the primary responsibility. This is the greatness of Abraham at this time. “A ram…in a thicket…Abraham…offered it” – God did indeed provide the lamb for the sacrifice. Abraham must have been overtaken by joy and relief when God provided. In a similar manner, Isaac must have been in a state of confusion over what had just happened. “The Lord will provide” – Abraham named this place Jehovah Jireh. The word translated “provide” is often translated as “to see.” The “mountain of the Lord” refers to the Temple Mount in Jerusalem after David takes Jerusalem (Ps 24:3; Isa 2:3; 30:29; Zech 8:3). “By myself I have sworn” – By who else can the creator of the universe swear (Heb 6:13)? He alone is sovereign. He alone can bless the faithful. Again, God swears His intention to bless Abraham and to multiply his offspring. Through Abraham, all the nations of earth would be blessed. This is ultimately carried out in the birth, death, crucifixion, and resurrection of Jesus Christ. Isaac appears to be a type of Jesus. Faith in action: The narrative provides us with an important teaching about the Lord’s dealings with his people—he tests them.” When God tested His people, He was determining the quality of their faithfulness (cf. Exod. 15:22–27). But, when humans test God, they are demonstrating a weakened faith or a lack of faith (cf. Exod. 17:7; Num. 14:22). From Genesis 22, we learn God may examine the faith of His people by calling them to obey him in ways that seem inexplicable. The fear of God: Abraham exhibited his faith through obedience, showing that he feared God. Abraham was able to demonstrate his faith in God only because he feared God. When the angel appeared, we learn that Abraham had passed the test. The angel said, “Now I know that you fear God, seeing you have not withheld your son, your only son, from me” (Gen 22:12). This is what God did to demonstrate His love for mankind (John 3:15; Rom 5:8). Worship is an expression of faith. From Gen 22:1-19, we learn three timeless truths regarding worship. First, the faithful completely obey the Word of God. Second, the faithful surrender the very best to God; they hold nothing back. Third, the faithful rest in the Lord and wait for Him to provide all their needs. God did not hold back when He promised to provide for all of our needs. Rom 8:32 says: He who did not spare His own Son, but delivered Him up for us all, how shall He not with Him also freely give us all things? Yet, God does not provide until personal sacrifice has been made. True worship is costly. Isaac is a type of Christ: Isaac represented a type of Christ. Jesus testified regarding Himself by saying, “For if you believed Moses, you would believe me; for he wrote of me” (John 5:46). Where did Moses write of Jesus? One place is Genesis 22. There are nine parallels between Isaac and Jesus. Both Isaac and Jesus were sons of promise. Both Isaac and Jesus were called the only begotten sons of their fathers. Both Isaac and Jesus carried the wood up the hill on their own backs. Both were to be offered as a burnt offering for sin. Both willingly allowed themselves to be placed on the wood they had carried on their backs to the top of the mountain. Both Isaac and Jesus were “dead” for three days. Both, being raised up, were given a bride selected by their fathers through whom all the world would be blessed. As you can see, Genesis 22 is a very important scripture that points to the necessity of faith in order to obtain the righteousness of God. Paul reflects on Abraham as an example of justification by faith (Rom 4:1-25). Abraham was not justified by works (Rom 4:1-3). This concept is deeply rooted in the Old Testament (Gen 15:6) and completes the idea that the righteous (in all times) shall live by faith (Rom 1:17). Abraham was justified because 1) God tested his faith and 2) Abraham was found to fear God (Gen 22:1-19). Though the Jews misunderstood this concept, Abraham’s justification was based on God’s promise, which he accepted by faith (Rom 4:13-25). God’s promise is not through the Law (Rom 4:13-15), but it is received by faith (Rom 4:16-17). Since Abraham received righteous by faith, the believer of today receives righteousness by faith. Salvation is universally available to all who accept Jesus Christ by faith. There are no works that can be done that result in receiving the righteousness of God. Are you prepared for the testing of your faith? Will you trust God even in situations that seem preposterous? Will you follow God’s commands even when they are ridiculed by the culture in which you live? No Replies to "The Testing of Abraham"